To mulch or not to mulch is a question that drives me crazy every gardening season. I lose the war against the weeds every year in the summertime when it’s hot and rainy. Two years ago, we expanded our vegetable gardening area. We had a friend with a machine that scraped up the sod for us. I used a newly purchased roto-tiller to till the area. I mixed up a fabulous COF (complete organic fertilizer) fertilizer recipe created by the gardening guru, Steve Solomon. Then, I planted tons of black-eyed peas as a cover-crop for the summer. They seemed to grow up overnight… and so did the weeds. It was a nightmare. I had created a huge garden area that seemed impossible to keep up with. It quickly turned into a huge patch of weeds to my knees. The theory that the black-eyed pea plants would shade out the weeds did not work. I’m sure the snakes were thrilled. I remember lots of spiders moved in. However, we did have several bountiful harvests of black-eyed peas. The black-eyed peas were young plants in this picture. The weeds had already won. After a month or so of looking at our forest of weeds, my husband weed-whacked it all down for me. I roto-tilled it again. Then, I covered the entire area with a thick layer of newspaper. I topped the newspaper with a thick layer of chipped-wood mulch. This mulched area was weed-free for about a month… maximum. The weeds came back with a vengeance. That’s when I marched down to my local hardware store and bought the black plastic. To be honest, it was a life-saver back-saver. I don’t care what the organic, sustainable gardening police say… this method is what has allowed me to keep my sanity. The black-eyed peas after they'd been weed-whacked. Clear plastic was our choice as a summer time mulch this year. The problem with the plastic is that it breaks down. It disintegrates into dust and must be replaced. Plastic is an inorganic mulch and ends up in a landfill. It’s definitely not the ideal mulch, but it keeps me from being overburdened and giving up. It keeps the weeds arrested and detained. 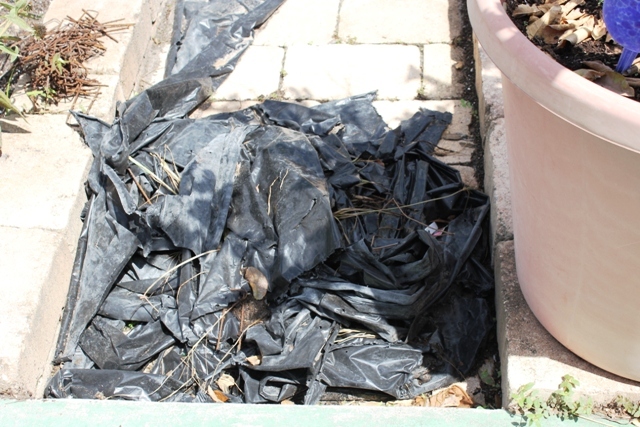 A mess of black plastic destined for the landfill. Any mulch you use in your garden, whether organic or inorganic, is a good thing. 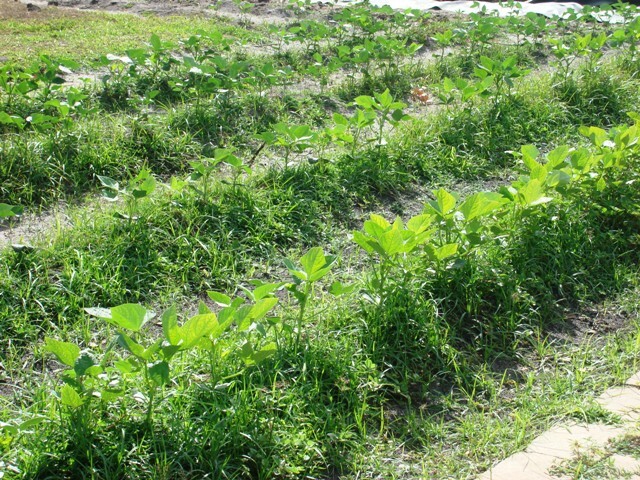 It not only keeps weeds at bay, but it conserves water and helps you grow bigger, better crops. It acts as insulation by keeping the soil cooler in the summer and warmer in the winter. 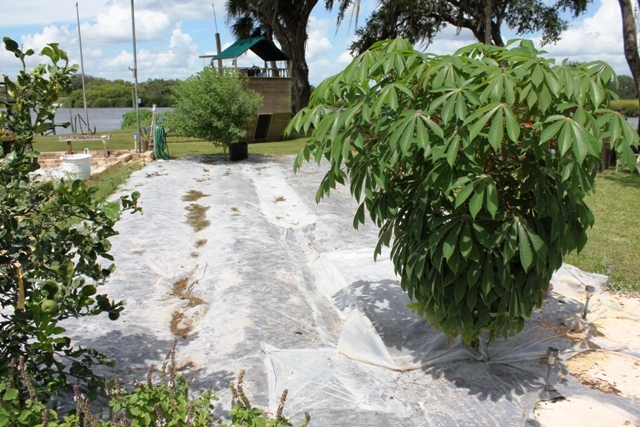 Your garden will survive without mulch, but there is a noticeable difference when it is used. I mulch my potted plants too. 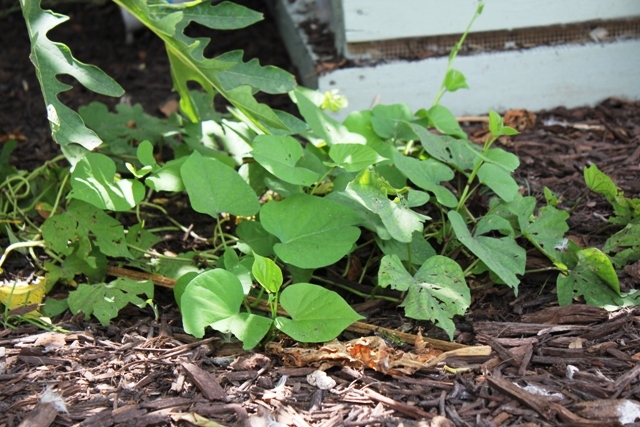 Sweet potato vine mulched with chipped-wood. Organic mulch breaks down in your garden soil and helps to provide nutrients. Some people use grass clippings from their lawn as mulch. It adds a lot of nitrogen to your garden, but sometimes it’s too much. I know quite a few people who use pine needles, but it is very acidic. It can cause an imbalance in your garden soil. Oak tree leaves can do the same thing. However, I think it would take an excessive amount for this to happen. When I used chipped wood in my veggie beds, I found that it didn’t want to break down into the soil easily. It ended up becoming a burden to me because the chips got in the way. However, the chipped wood did wonders for all my fruit trees and looks beautiful. 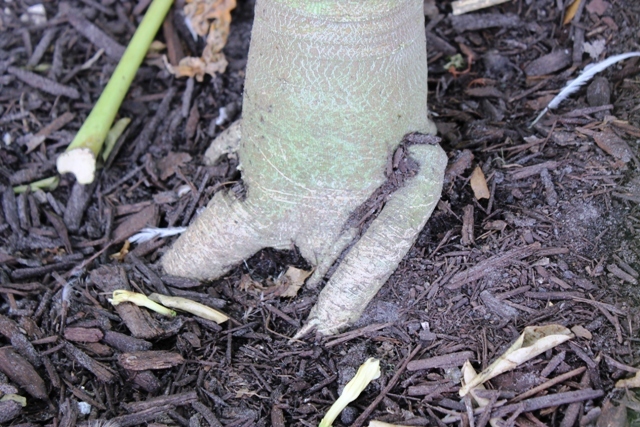 Papaya tree mulched with chipped-wood. I still love the idea of finding a sustainable, organic mulch that will actually keep the weeds manageable. But, I also want it to look nice in our yard. My husband and I keep looking at all the spilled hay that our goats spread around their area. Goats won’t eat hay once it falls to the ground, so it becomes bedding. I think we could let a few bales of hay sit outside for a while and weather, then use them as mulch. I’m going to give this experiment a try on a few of our garden beds for our fall vegetable garden. I’ll let you know how it goes. Gardening is not an exact science and I believe the saying, “different strokes for different folks” definitely holds true when it comes to a family garden. I prefer the saying, “just do it”.